As training camp wraps up and the regular season just around the corner, let’s take a peak and see how the NBA’s newest franchise is looking like as they get ready for their inaugural season in the league. 1. Blatt is running triangle. Having never actually gotten a legitimate chance to coach with his system in Cleveland, Blatt is taking the opportunity here with a new expansion club to instill his offensive philosophies into the foundations of the team. Namely, an equal opportunity offense. Judging from the half court sets that the Sharks ran again and again during training camp, it appears to be a slightly altered version of Tex Winter’s triangle offense, a system that won Hall of Fame coach Phil Jackson 11 NBA titles, 6 of which was won here in Chicago. It’s not what he ran in Europe, but the philosophy is the same, and we’ve all seen how effective the triangle and triangle concept variations have worked in the league in the past (if one ignores the Knicks, that is). 2. Position battles are still ongoing. As one might expect from an expansion team, there is no clear cut stars or even a clear cut lineup and rotation on paper. Despite all the competition in camp, head coach David Blatt says he’ll have to tinker as the season progresses, and might go with an 11 or even 12 man rotation to start the season. Right now, the preliminary starters appear to be Patty Mills, Tony Allen, Jeff Green, Taj Gibson, and Boban Marjanovic. 3. Boban impresses. Coming into camp, the anticipation was on first pick [of the expansion draft] Patrick (Patty) Mills to lead the way. 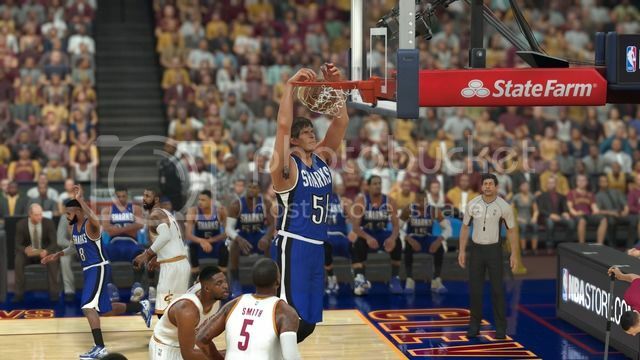 Instead, it was another former Spur – 7 foot 3 Serbian center Boban Marjanovic – who really impressed the coaching staff, dominating defensively from start to finish, blocking shots and crashing the boards with impunity against his front court teammates. Key Factor for Success: Generating turnovers on defense. Chicago is a team with marginal offensive talent, and it showed in camp. Scrimmages were often low scoring slugfests, more so due to the inability to make shots rather than good defensive pressure, which they can apply with their incredible length - four 7 footers in the front court and a bunch of players over 6-6 on the wings – but against other teams this will be a problem. The Sharks will have to get (lots of) points in transition in order to score enough to win games. Can they do it? That’s the million dollar question. Player I saw and really liked: Briante Weber, second year guard from VCU. He may be third on the depth chart behind Patty Mills and Ty Lawson, but if he ever gets on the floor, watch out. Weber possesses tremendous energy and a nose for the ball on defense, and could spark a lot of those fast break opportunities that the Sharks really need. At VCU, Weber was only 12 steals away from becoming the NCAA’s all-time leader. The man is a ball hawk. Gut feeling: Expectations are low for expansion clubs, and it will take a while for the team to grasp the offense. Blatt’s job is to keep the team competitive and instill a positive culture into the foundation of the franchise. The Sharks open up the season with 3 of their first 4 games against the defending champions, and the other one against the Spurs. It’ll be a struggle, but if they get through it, they have a much softer schedule later on that should make their record respectful, finishing around the 30-35 win range. Lamrock wrote: Jerseys and court look good, man. If you're gonna lose 60 games, might as well look good doing it. The Chicago Sharks today announced the team's 2016-17 Opening Day roster. After signing Briante Weber and Metta World Peace prior to training camp, the Sharks roster stood at the maximum number of 15 and opted to keep everybody heading into the season opener. The Sharks will open their inaugural season in the NBA on Tuesday, October 25 at the defending champion Cleveland Cavaliers. The team's home opener is the very next night, also against the Cavaliers. 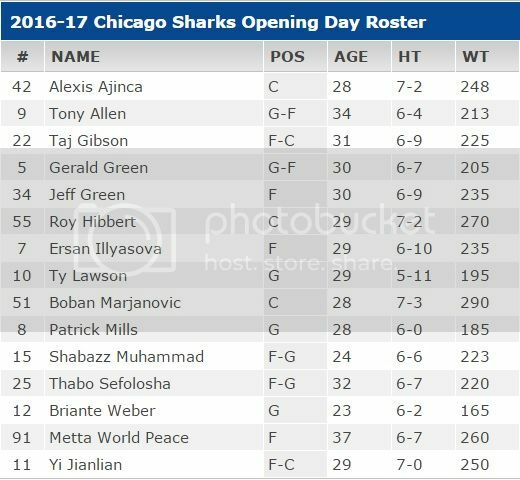 Chicago's full 2016-17 Opening Day roster is below. Oof, Cavs in Cleveland. Good luck. Hope you at least do better than the Knicks did against them irl. 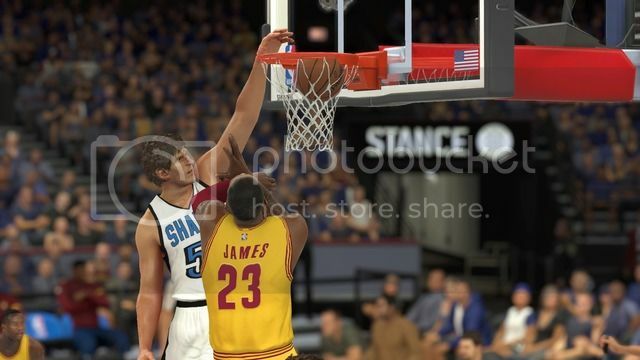 Lamrock wrote: Oof, Cavs in Cleveland. Good luck. Hope you at least do better than the Knicks did against them irl. Yeah, first five games of my schedule is back to back vs Cavs, Spurs, Cavs (yeah, again), and Kings. Not ideal at all. That is a brutal schedule to start with. Hopefully you can at least grab a win against Sacramento. You do have a lot of solid veteran role players though, so you should be okay this season. How is your cap room situation looking for next season? Phil89 wrote: That is a brutal schedule to start with. Hopefully you can at least grab a win against Sacramento. Cool. It's gonna be interesting to see if you go full Miami 2010 or go the other way and create a deep and well-balanced team. Phil89 wrote: Cool. It's gonna be interesting to see if you go full Miami 2010 or go the other way and create a deep and well-balanced team. Cheers mate, with exams out of the way I'm finally gonna be able to play some games and push some updates out, stay tuned! Cleveland, OH -- The Chicago Sharks stood courtside and watched as the Cleveland Cavaliers raised their championship banner and received their rings in an elaborate pregame ceremony filled with joy and celebration for the entire 20,562 capacity crowd at the Quicken Loans Arena, thinking to themselves that one day that will be them. They then went out onto the floor with an impossible task – upset the defending champs with the first game in franchise history. Now, they didn’t quite get there, but the Cavaliers got more than they expected, as the Sharks announced their arrival into the league with an entertaining and hard fought 106-94 loss to the defending champions. Hot shooting Ty Lawson led the way for Chicago with 17 points and 6 assists from the bench on 7 of 12 shooting, including 3 of 4 from deep, he also had 4 steals. Roy Hibbert also produced 17 off the bench. But the story of the night was the production of starting center Boban Marjanovic, who not only scored the first basket in Sharks franchise history with a two handed jam to begin the contest, but filled it up in every statistical category, narrowly missing out on the elusive 5 by 5 (he did end up with a 5 by 4) with a stat line of 9 points, 12 rebounds, 4 assists, 5 steals and 4 blocks in just 24 minutes of play. Only 10 players in NBA history have achieved a 5 by 5. “Boban was fantastic for us tonight, he was just everywhere.” said Sharks head coach David Blatt, who also received a championship ring from the Cavaliers in the pregame ceremony. However, it was ring night, and the defending champions weren’t about to let anyone spoil it for them. 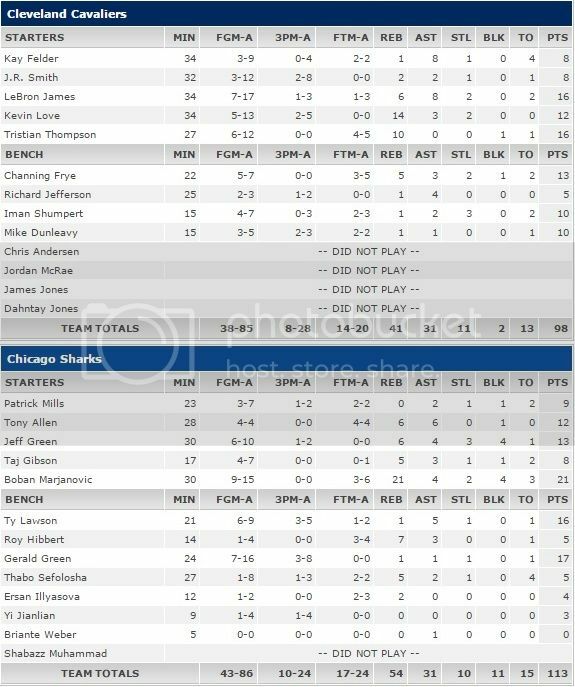 J.R. Smith led the way with 24 points, Kevin Love had 18-7-6, while LeBron James added 15-6-7 as the Cavaliers overcame a Kyrie Irving injury (11 points, 4 assists in 17 minutes) to hold onto their 16 point first half lead and pull off the opening night victory over Chicago. Irving was diagnosed with a broken right toe and is expected to miss up to four weeks. “Losing Kyrie was obviously huge, but I’m proud of the way the guys hung in there and got the result in the end.” said Tyronn Lue. The Sharks and Cavaliers will play again tomorrow night in Chicago. Re: Alternate Reality - Season Opener! Solid effort in your first game as a franchise. Hopefully you can get closer in the next game with Kyrie out. Interested to see whether Lawson will remain on the bench, or whether he'll take over as the starter. Chicago, IL – As the final seconds ticked off the clock, the capacity crowd at Chicago Stadium went on their feet, cheering and applauding as confetti rained over their heads to celebrate the first victory in Chicago Sharks history. It took a while, but it was here at last, and over the defending champions, no less. After three straight defeats to begin the season, in which two came courtesy of LeBron James and his Cavs, this first victory was even sweeter to savour over. 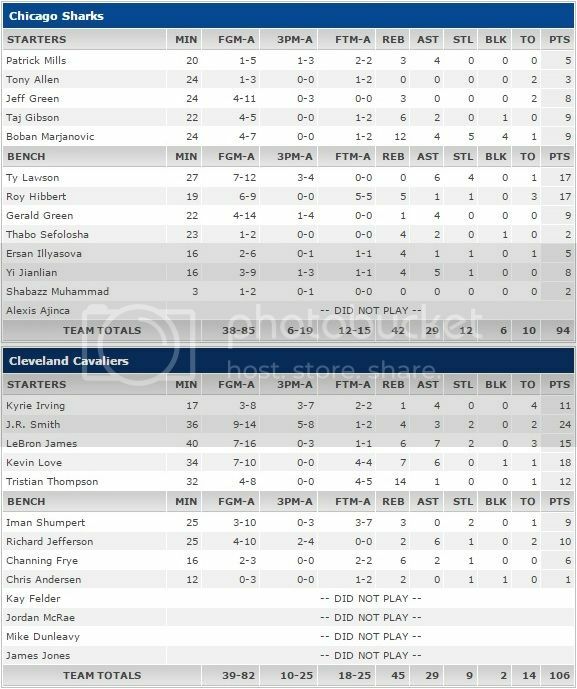 Led by Boban Marjanovic, who had a career night with 21 points, 21 rebounds, 4 assist, 2 steals, and 4 blocks on 9 of 15 shooting; the Sharks held the Cavaliers to just 40 points in the second half after trailing by as many as 16 points in the first half, and came away with a 113-98 victory over their central division rivals. It was the first 20-20 game in Marjaovic’s career. Ty Lawson had 16 points and 5 assists off the bench for the Sharks, while Jeff Green added to the defensive charge with 3 steals and 4 rejections alongside his 13 points. Thanks to the all-rounded efforts from LeBron James, the Cavaliers got off to an early lead and looked as though they were going to repeat the results of the teams’ first two meetings, ending the first half with a 10 point lead and dominating the Sharks in every team statistical category, but momentum quickly changed in favour of Marjanovic and the Sharks in the second half, emphasised by a facial served up by the Serbian center over LeBron James. After looking as if he was en-route to a triple double in the first half, James ended with just 16 points, 6 rebounds, and 8 assists on 7 for 17 shooting from the field. Tristian Thompson had 16 points and 10 rebounds, while Kevin Love also notched a double double with 12 points and 14 boards. However, without the services of Kyrie Irving, who is still out with a broken toe, the Cavs just didn’t have an answer offensively in the second half, ending the game with a miserable 8 for 28 outing from deep. 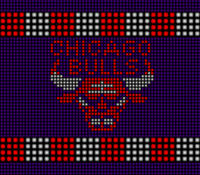 This marks the first loss for the defending champions this season, as they came in with a perfect 4-0 record; they will face the Bulls tomorrow night at the United Center. The Sharks are now 1-3, and will look to add to their win total against the Kings on Thursday. Phil89 wrote: Solid effort in your first game as a franchise. Hopefully you can get closer in the next game with Kyrie out. Andrew wrote: Interested to see whether Lawson will remain on the bench, or whether he'll take over as the starter. Re: [1-3] Alternate Reality - Unleash The Boban! Sharks point guard Patrick (Patty) Mills will miss approximately 6-8 weeks with a high left ankle sprain. Mills suffered the injury during the third quarter of the Sharks’ 102-82 victory over the Miami Heat on Tuesday night. X-Rays were negative and he returned to Chicago for further diagnosis this morning. He will not be re-joining the team on their road trip to Detroit and Oklahoma City this weekend. Taken second overall by Chicago in the 2016-17 NBA Expansion Draft after 5 seasons with the San Antonio Spurs, the 8th year veteran has been averaging 10.6 points and 3.8 assists per game through 12 games so far this season as the Sharks’ starting point guard. Ty Lawson is expected to replace Mills in the starting lineup. Re: [4-8] Alternate Reality - Injury! That might turn into an interesting battle for the starting spot once Mills is healthy. After surrendering 8 straight points in a mere span of 36 seconds and facing the prospect of going into overtime, Thunder head coach Billy Donovan ripped into his players during the ensuring timeout, stating the importance of closing out a game properly. 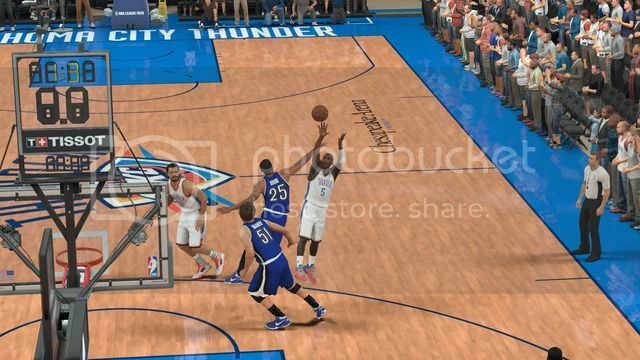 Victor Oladipo got the message. With just 3.7 seconds remaining on the clock and the game tied at 104 apiece, the fourth year guard from Indiana got the ball off a Steven Adams hand-off and subsequent screen, bypassed the outstretched arms of 6-7 Thabo Sefolosha, and fired away just before the buzzer sounded. 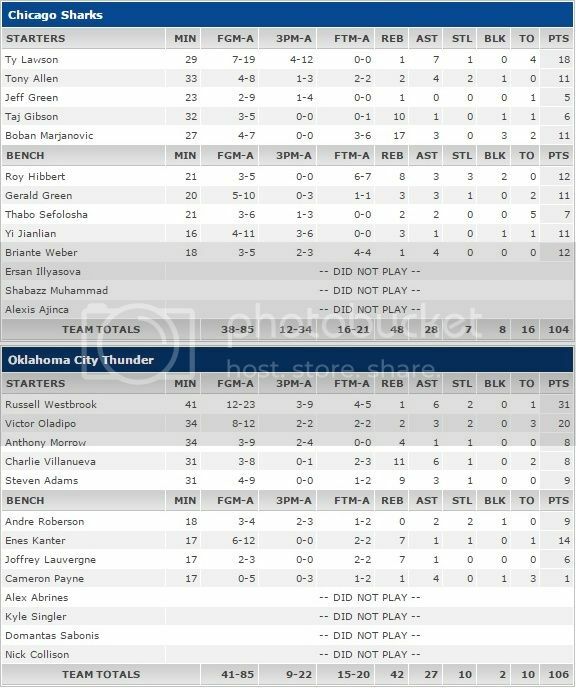 Led by Westbrook’s 31 points and 6 assists, the Thunder came out strong against the 4-9 Chicago Sharks, and was in command for most of the game, surviving a small rally in the third quarter for the most part, and took a seemingly insurmountable 104-96 lead with under a minute to go, but the visitors had other ideas. Boban Marjanovic sprinted down the middle of the floor and received a nice dish from point guard Ty Lawson for a quick dunk after Oladipo hit his free throws, then after a questionable shot attempt early in the clock by OKC, Lawson pulled up and hit a three pointer. Another defensive stop on the subsequent possession eventually turned into another three pointer from the Sharks, this one coming from backup forward Yi Jianlian, and suddenly the game was tied with very little time remaining. Ty Lawson led the way for the Sharks with 18 points and 7 assists, starting once again with Patrick Mills side-lined, while Boban Marjanovic had another big night, finishing with 11 points, 17 rebounds, and 3 blocks. “I thought our guys did a tremendous job never giving up and competing hard to make it a contest” said Sharks head coach David Blatt. It just wasn’t enough to upset the Thunder in OKC. The Sharks now drop to 4-10 for the season, and will return home to Chicago to face the Indiana Pacers on Monday. Andrew wrote: That might turn into an interesting battle for the starting spot once Mills is healthy. Re: [4-10] Alternate Reality - Thriller @ OKC! Really unlucky to lose like that. 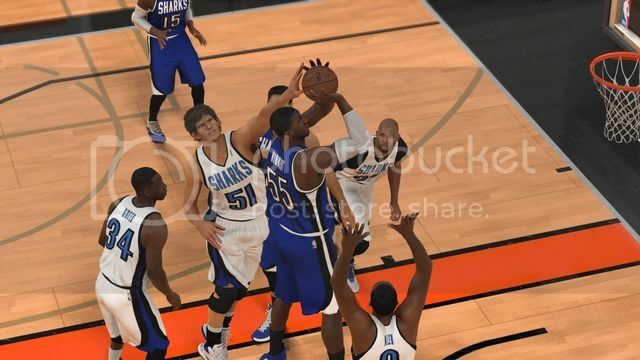 Still, it was a good performance against a strong western conference team. Lawson played well in his expanded role. At least that's something positive. Phil89 wrote: Really unlucky to lose like that. Still, it was a good performance against a strong western conference team. Yeah I was happy with it, surprised we were even able to go on that 8-0 run to tie things up before Oladipo's shot, especially considering how offensively challenged we generally are. Lawson needs to shoot better but it is encouraging.